The Revista Brasileira de Informação Bibliográfica em Ciências Sociais - BIB -, first released in 1977, is bound to Associação Nacional de Pós-Graduação e Pesquisa em Ciências Sociais (ANPOCS) (National Association of Post-Graduation and Research in Social Sciences). 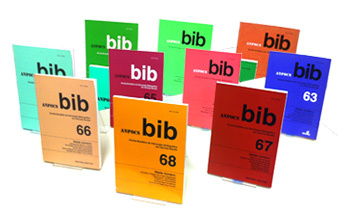 With biannual issues, BIB is dedicated to the publication of bibliographical balances, in other words, it only includes articles focused on the construction and articulation of debates, based on publications or authors, that confront the diverse range of approaches, theories and concepts used to understand or explain certain matters and subjects of study. Reviews, interviews, translations and original articles that have bibliographical debate only as background will not be accepted. BIB’s main areas of study are Sociology, Anthropology and Political Science – a field that includes International Relations. However, we also consider the interdisciplinary dialogue to be a common and pertinent practice, particularly for bibliographical balances and thus other areas such as Law, Economics, Public Administrations, History and Education may be incorporated, as long as they are explicitly linked to the journal’s main fields. The submitted articles must be inedited (they cannot have been published before in books or other journals) and an exclusivity pact must be kept with BIB during the evaluation process. BIB accepts submissions of articles written by post-graduate students or from professionals that hold, at least, a Master’s degree. The editors and the Editorial Committee, through periodical meetings and tools to ensure the registration and consolidation of information, will systematically follow the flux of the articles, from submission to publication. BIB’s priority, besides the scientific quality of the articles, will be to rectify the journal’s punctuality. After submission, the articles undergo a process of desk review in order to assess their suitability to the journal’s goals and editorial policy. Within a maximum period of 30 days, the authors will be informed of the results of this first phase (accepted or declined). To ensure a higher control level of the scientific quality of the articles, proposals are anonymously analyzed by two examiners designated by the editors, the Editorial Committee or the Editorial Council. In case there is a divergence of opinion, a third person can be called in to settle the matter. Regarding the evaluation process, there are four possible outcomes for the second phase: the articles can be classified as (i) approved for publication without modifications, (ii) approved for publication regarding modifications, (iii) apt for resubmission after revision and (iv) declined. In case of resubmission BIB can either accept or decline the manuscript once again. This stage takes an average period of 90 days. Those articles approved for publication without modifications (i) and approved for publication regarding modifications (ii) must be sent within a maximum of 30 days following the results assignment. After this deadline they will no longer be considered by the Editorial Committee. Those articles classified as apt for resubmission after revision (iii) must be edited and sent back within a maximum of 60 days. The Editorial Committee reserves the right to recommend new punctual changes to articles of categories ii and iii regarding their contents and style in order to make them fit the graphical and editorial profiles of the journal. The publication of dossiers may be approved under exceptional circumstances and depends on an internal decision of the editors in cooperation with the Editorial Committee – in agreement with BIB’s editorial policy. Spontaneous proposals will not be accepted. Only submissions in fields seen as priority and via public edicts will be considered. The evaluation of dossiers consists of a double-blind peer review process that follows the same criteria and deadlines applied to single articles. Article submission and evaluation by double blind peer review system implies the commitment of the authors to address as satisfactorily as possible the observations and criticisms of the reviewers. BIB appreciates the effort of the academic community in order to contribute with their work to an improvement regarding the quality of scientific production in the field of Social Sciences in Brazil. Therefore, the journal reserves the right to refuse articles whose reformulation disregard the reviewers’ recommendations without reasonable justification. The authors who decide to submit their articles must agree to the commitment to issue their opinions. In line with the advancements in the field of ethics and good scientific practices, all the articles approved in the first phase undergo verification tests in order to identify possible cases of plagiarism and “auto-plagiarism” or republication (publication as inedited of articles already published). Occasional cases of bad practice will be evaluated and stated by the Editorial Committee according to the Diretrizes Básicas para a Integridade na Atividade Científica (Basic Guidelines for the Integrity of Scientific Activity) of the Conselho Nacional de Desenvolvimento Científico e Tecnológico – CNPq (http://www.cnpq.br/web/guest/diretrizes) and the Código de Boas Práticas (Good Practices Code) of the Fundação de Amparo à Pesquisa do Estado de São Paulo – FAPESP (http://www.fapesp.br/boaspraticas/). The opinions expressed in signed articles and the integrity of their contents are the absolute responsibility of their authors.